Proprietary Name: Basic Care Severe Cold And Flu What is the Proprietary Name? Non-Proprietary Name: Acetaminophen, Dextromethorphan Hbr, Phenylephrine Hcl What is the Non-Proprietary Name? 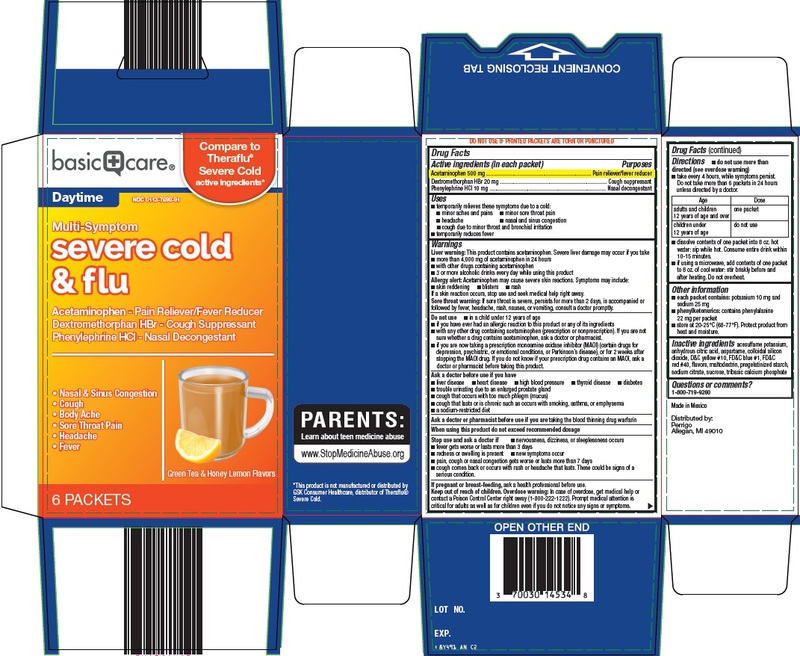 Basic Care Severe Cold And Flu with NDC 0113-7690 is a a human over the counter drug product labeled by L. Perrigo Company. The generic name of Basic Care Severe Cold And Flu is acetaminophen, dextromethorphan hbr, phenylephrine hcl. The product's dosage form is powder, for solution and is administered via oral form. Liver warning: This product contains acetaminophen. Severe liver damage may occur if you take •more than 4,000 mg of acetaminophen in 24 hours •with other drugs containing acetaminophen •3 or more alcoholic drinks every day while using this productAllergy alert: Acetaminophen may cause severe skin reactions. Symptoms may include: •skin reddening •blisters •rashIf a skin reaction occurs, stop use and seek medical help right away.Sore throat warning: If sore throat is severe, persists for more than 2 days, is accompanied or followed by fever, headache, rash, nausea, or vomiting, consult a doctor promptly. •in a child under 12 years of age •if you have ever had an allergic reaction to this product or any of its ingredients •with any other drug containing acetaminophen (prescription or nonprescription). If you are not sure whether a drug contains acetaminophen, ask a doctor or pharmacist. •if you are now taking a prescription monoamine oxidase inhibitor (MAOI) (certain drugs for depression, psychiatric, or emotional conditions, or Parkinson’s disease), or for 2 weeks after stopping the MAOI drug. If you do not know if your prescription drug contains an MAOI, ask a doctor or pharmacist before taking this product. •nervousness, dizziness, or sleeplessness occurs •fever gets worse or lasts more than 3 days •redness or swelling is present •new symptoms occur •pain, cough or nasal congestion gets worse or lasts more than 7 days •cough comes back or occurs with rash or headache that lasts. These could be signs of serious condition. •do not use more than directed (see overdose warning) •take every 4 hours, while symptoms persist. Do not take more than 6 packets in 24 hours unless directed by a doctor.AgeDoseadults and children 12 years of age and overone packetchildren under 12 years of agedo not use •dissolve contents of one packet into 8 oz. hot water: sip while hot. Consume entire drink within 10-15 minutes. •if using a microwave, add contents of one packet to 8 oz. of cool water: stir briskly before and after heating. Do not overheat. •each packet contains: potassium 10 mg and sodium 25 mg •phenylketonurics: contains phenylalanine 22 mg per packet •store at 20-25°C (68-77°F). Protect product from heat and moisture.